Rebellious, offbeat and even downright crazy, the singular hexagonal nut-design watch by Greco Genève steps things up another notch by adopting a fluorescent look. An original new iconic model in Les Temps Modernes collection whose stylistic inspiration stems from the masterful Modern Times film by the well-known artist, the LTM22t stands out in several ways. 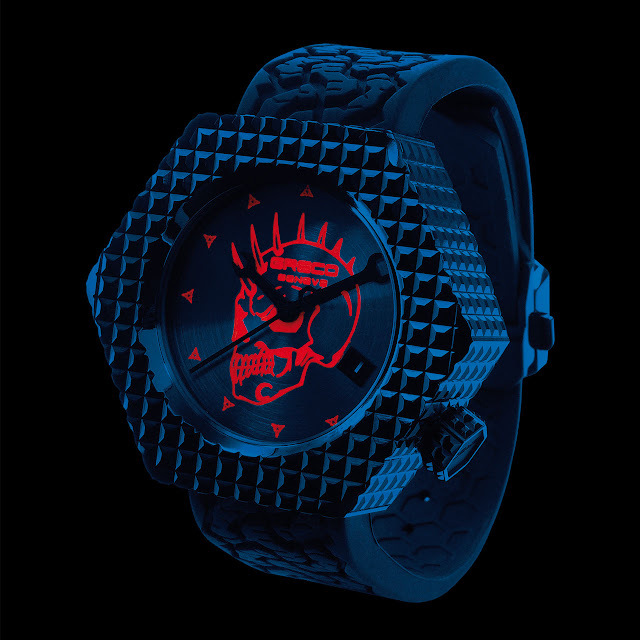 First and foremost, its black DLC-treated titanium case shaped like a hexagonal nut naturally catches the eye. 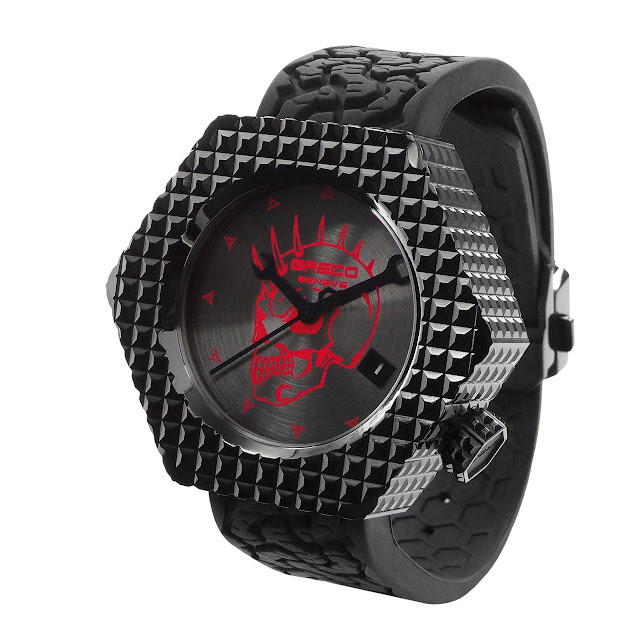 Secondly, the skull motif asserts itself as a deliberately non-conformist signature by day or night. Greco Genève enhances the originality of the hexagonal nut shape by fluorescent pigmentation based on a chemical compound used in making banknotes and detectable under UV light. Since the use of the latter is subject to strict quotas, the LTM22t is issued in a 33-piece limited edition. A contemporary and eccentric watch embodying an amazing blend of mechanical horology and highly innovative chemical processes. Mechanical automatic, ETA 2892 calibre, 21 jewels, 42-hour power reserve. Polished and satin-brushed DLC-treated grade 5 titanium, Clous de Paris hobnail motif, 43 x 49 mm. Sapphire crystals, front and back. Water-resistant to 30 metres (3 bar/100 ft). Anthracite, circular satin-brushed, fluorescent red-lacquered skull. Fluorescent red cross-motif hour-markers. Date at 4 o’clock. Black rubber, black DLC-treated titanium folding clasp.